Love all around! Kendall Jenner took a page from Rihanna’s style book for a Thursday, October 6, photo opp — the first time she’s posted since Kim Kardashian’s robbery in Paris on Monday, October 3. 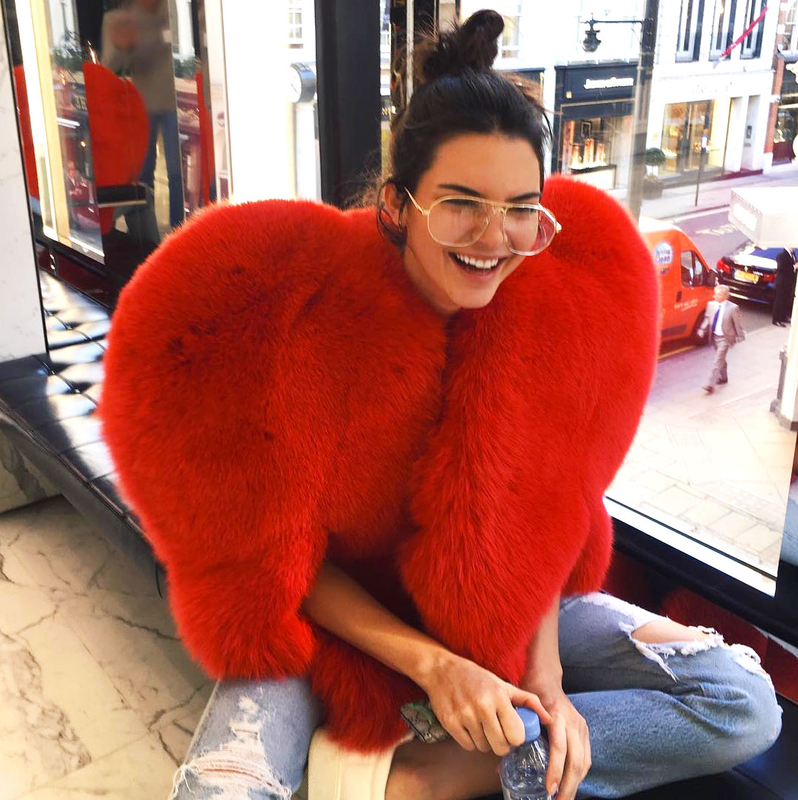 The model, 20, posed a massive red heart-shaped Saint Laurent Fox Fur Coat. The $15,500 piece features exaggerated shoulder pads and sharp hems to really create a standout shape. Per her Instagram, which gathered 1.2 million likes in just three hours, Jenner styled her outerwear with a pair of ripped light-wash jeans, white leather sneakers and an oversized pair of gold-rimmed glasses. “low key look,” she joked of the ensemble. Rihanna also chose the subtle coat for a late New York City night that melted into an early morning on September 5. For a paparazzo’s birthday party, the “Love On the Brain” musician, 28, styled her coat with tiny denim shorts, black leather wraparound Dsquared2 Riri Sandals, a Chanel box bag and a hat printed with the name of a Swedish metal band, Bathory. “I❤NY,” she captioned an #OOTN photo that evening. But a few hours later, she traded her nearly 5-inch heels for a pair of her own silver Puma Fenty Fur Slides to feed pigeons at 7 in the morning (yes, really!). The fashionistas have more than outerwear in common. Both spent time at Paris Fashion Week, which wrapped on October 5. Rihanna headed to the City of Light for business and pleasure. She presented her Marie Antoinette–inspired Fenty x Puma collection on September 29, and sat front row at Dior’s October 1 show clad in an embroidered, cold shoulder white mini dress. Jenner walked in the Givenchy show on October 2, wearing a closely-cropped short wig. So tell Stylish: which love-ly lady warms your heart more, Rihanna or Jenner? Vote in the poll below and let Us know!